Victory Gardens Theater introduces Backstage at the Biograph, a new event series that takes audiences behind-the-scenes for an in-depth look at a unique aspect of the rehearsal process of each production throughout the season. The first Backstage at the Biograph focuses on Sucker Punch by Roy Williams, directed by Dexter Bullard, running September 18 – October 18, 2015. Backstage at the Biograph: Blow-By-Blow highlights the intensive boxing training actors must go through for the production. Backstage at the Biograph: Blow-By-Blow is Wednesday, September 9, 2015 at 7:00 p.m. at Victory Gardens Biograph Theater, 2433 N. Lincoln Avenue. Backstage at the Biograph: Blow-By-Blow features Sucker Punch Boxing Coach Ruben Gonzalez, Fight Choreographer Chuck Coyl, and actors Maurice Demus and Denzel Love. The evening is hosted by Literary Manager Isaac Gomez. When professional sports meets professional theater, something electric happens. Get a blow-by-blow account of what it takes to stage a full on boxing match for Roy Williams’ hit boxing drama Sucker Punch at this open rehearsal kick-off party. Join Sucker Punch Boxing Coach Ruben Gonzalez and Fight Choreographer Chuck Coyl as they give you a backstage look at the world of boxing, with demonstrations from actors Maurice Demus and Denzel Love. Then, enjoy a complimentary reception and mingle with the cast and creative team to get the inside scoop on the process. This event is free and open to the public. Space is limited and an RSVP is required. For more information visit victorygardens.org/backstage. Backstage at the Biograph is sponsored by Whole Foods Market. It’s the 1980s, Michael Jackson rules the radio waves and Conan the Barbarian is the box office king at the movies. Aspiring black boxers, Leon and Troy, both have promising futures in the ring. When race riots explode in their London neighborhood, these two friends are forced to make a tough decision. Years later, they square off, facing each other and the men they have become. 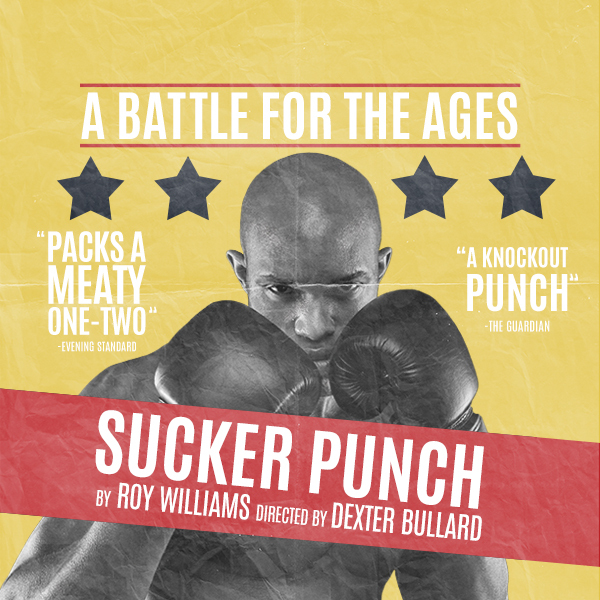 After premiering at The Royal Court in London, award-winning playwright Roy Williams’ Sucker Punch received four-star reviews from The London Times, Evening Standard, and The Telegraph and was called a “Knockout Punch” by The Guardian. This fast-paced, triumphant midwest premiere takes an unflinching look at family, friends and the world of boxing. The creative team includes Tom Burch (scenic), Tif Bullard (costumes), Lee Fiskness (lighting), Christopher Kriz (sound), Jay Tollefsen (props), Chuck Coyl (fight choreography), Ruben Gonzalez(boxing coach) and Helen Lattyak (production stage manager).